This past week we spent time developing more recipes for our vegetarian menus. 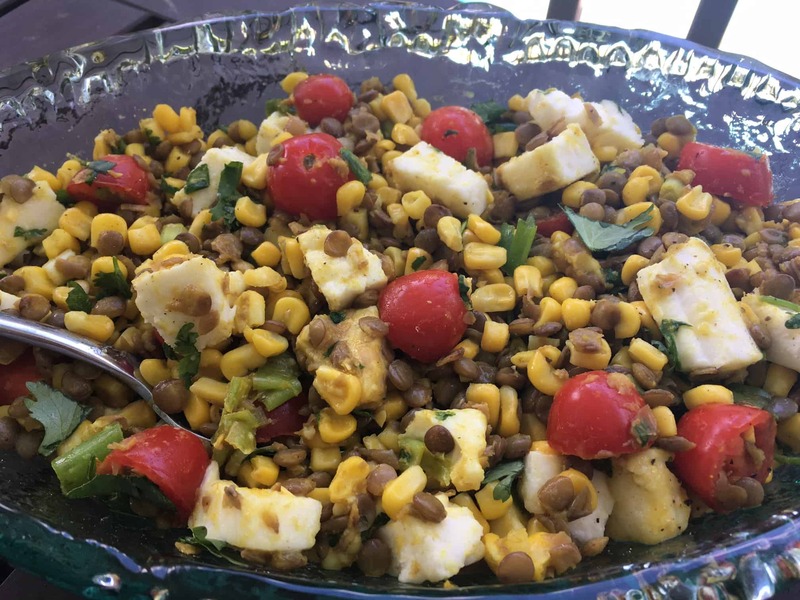 This corn and lentil salad was a real winner and even my non-vegetarian family loved it. This is a hearty dinner salad and even my two hockey loving boys both asked for 2nds (yes it really is true!). I never bothered to tell them they were eating lentils, they just knew it tasted good. This recipe has Indian inspired flavors and it really is delicious! I served it with some greens and cucumbers for a simple salad to round out the meal. It is also a great one to make ahead and leftovers make for an easy lunch the next day. All up it took about 30 minutes from the time I opened my pantry to the time it was on the table. Enjoy! Cook lentils according to package instructions. Drain and place in large serving bowl. While lentils are cooking, heat oil in medium skillet. Add garlic and cook for 1 min. Add corn and cook until just starting to brown, about 5 minutes. Add corn to bowl with lentils along with tomatoes, scallions, and cilantro. In a small bowl, combine the lime juice, honey, tumeric, cumin and salt and pepper to taste. Stir dressing into lentil and corn mix and stir gently until coated. Top with the mozarella and adjust salt and pepper to taste.